The Missouri Society of Professional Engineers strongly opposes SB 463, which requires companies with a state contract in excess of $100,000 for professional or technical services to purchase and use a computer software program to verify the hours billed for work done on a computer. Personal data from your computer must be stored for seven years. This bill, known as the “Software Tracking Bill”, is being pushed by a single company nationwide. Though the bill has been rebuked in nearby states and across the nation, the bill is picking up momentum in Missouri and could possibly latch to another bill as an amendment. Please contact your state senator and ask them to “vote no on SB 463 and any language that mandates companies to use tracking software”. Click the link below to look up your state senator. JEFFERSON CITY - MSPE President Michael Purol has announced a special membership meeting will be held on March 2 for the sole purpose of considering proposed by-law amendments. This is the rescheduled meeting for the one postponed in January for inclement weather. Over the last several months, the MSPE Bylaws Committee, crafted amendments to the existing society bylaws to comply with revisions to the NSPE Bylaws in the Spring of 2018. The new membership model became effective on July 1, 2018. MSPE contractually became an integrated society at that time. Revisions in the bylaws are required to ensure consistent policy between the MSPE bylaws and the NSPE Bylaws. Per Article XVII of the bylaws, the MSPE Board of Directors can approve amendments to "administrative" sections of the bylaws. The MSPE Bylaws require the Membership approve Amendments to sections labeled "governance". On October 12, the MSPE Board of Directors approved the "administrative" changes. During the same meeting, the Board of Directors approved holding a special membership meeting for the purpose of the membership voting on the "governance" amendments. This action satisfies the MSPE Article IV, Section 2 Bylaw requirement to call a special membership meeting. This notice is to comply with Article XVII, Section 2, providing thirty days-notice via electronic communication to the voting membership. During this meeting, the proposed amendments may be approved by a two-thirds vote of the voting members in attendance. A quorum is defined as being at least one voting member present from at least two-thirds of the chapters. A vote in favor approves the proposed changes. A vote against disapproves the proposed changes. Please click here for proposedbylaws. 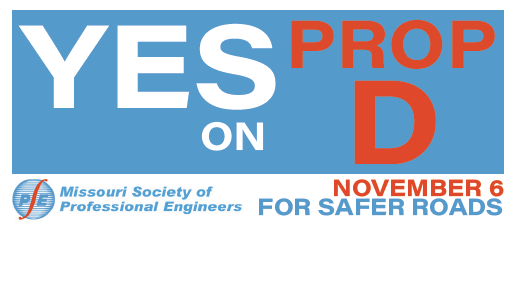 Jefferson City - The Missouri Society of Professional Engineers is featuring a new logo. During the January Board of Directors meeting, directors voted to adopt the new logo that makes MSPE more consistent with counterpart societies. Different formats for the state logo and chapters have been provided by NSPE. Each chapter president has received files for their logo in blue, black and white versions with transparent backgrounds. According to NSPE, 40 of the 48 state and territorial integrated societies have adopted the new NSPE state logo. MSPE now becomes the 41st. JEFFERSON CITY - MSPE President Michael Purol has announced the special membership scheduled for January 19 has been canceled due to winter weather concerns. The meeting was charged for the sole purpose of considering proposed by-law amendments. The meeting will be rescheduled for a date to be announced. MSPE apologizes for the inconvenience. JEFFERSON CITY- MSPE has a new website and a new membership database powered by Wild Apricot Membership Software. This software helps streamline membership services. With this new membership database, you will be able to log into the website and be able to make changes to your account yourself. If you change companies, email addresses, or contact information, instead of emailing us these changes, you will log into the MSPE website and make these adjustments yourself. This will improve efficiency and accuracy. This applies to both “three tier” and “two-tier members”. For “three-tier” members, even if you make that change on the NSPE website you will still need to make those changes with us on the MSPE website. From the website you will be able to see all the upcoming events as well as be able to register online for events such as Fall PDH Days, Annual Convention and chapter events that utilize online registration. You can also renew your membership, pay it online, or request an invoice. The content on the website should look very similar but more user friendly so if you haven’t spent much time on the MSPE website now is the time to check it out! Log in to MSPE’s website with your email associated with your membership. You will be prompted to reset your password by clicking “reset password”. You will be emailed a new password and can then change it from there. MSPE is partnering with the Minnesota Society of Professional Engineers (MnSPE) to offer PE exam prep courses to help you prepare for the October 2018 PE exam. Choose from civil (construction, geotech, structural, transportation or water resources/environmental), electrical power or mechanical (HVAC, machine design or thermal & fluids systems). Courses meet mid August through mid October. Attend via live webinar from your location - students can be anywhere (not just MN). Courses are relevant for students and PE exams throughout the country and use books and other course materials published by PPI, provider of the popular Lindeburg books. A free retake is GUARANTEED if you take this course but do not pass the October 2018 PE exam. The IT committee has been hard at work on developing a new website within Wild Apricot.